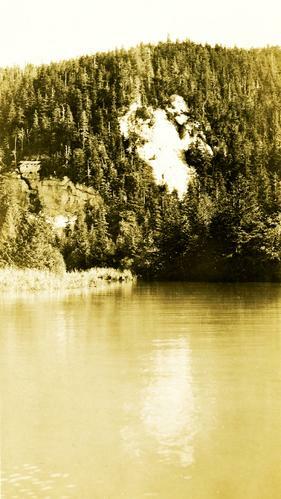 Photograph features a steep cliff across still water. Handwritten annotation on verso reads: "Place of Scalps / Kincolith BC"
Item is part of The Archdeacon W. H. Collison fonds. See also item 2009.7.1.150 for image featuring similar content. Stamped annotation on verso of photograph: "4".